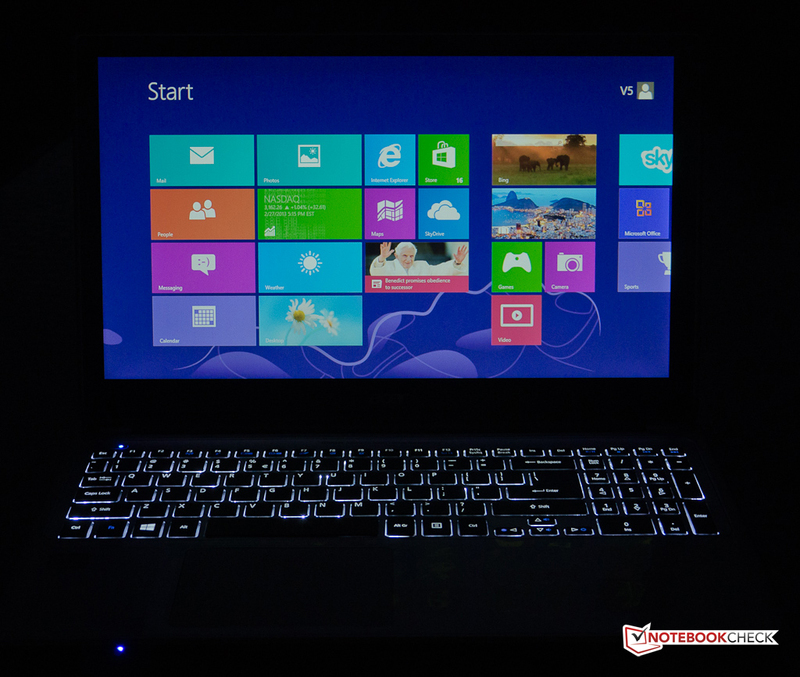 There is no doubt that Windows 8 has spurred the development of many new systems designed to take advantage of the new touch-optimized tile interface. 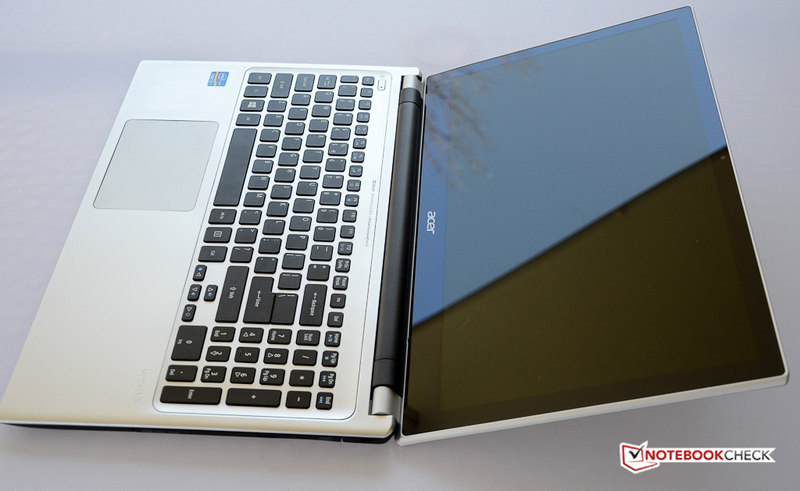 While some of the newer releases push the boundaries of the tried-and-true laptop design - take for instance the flip-hinge Dell XPS 12 - Acer decided to incorporate a touchscreen into a traditional clamshell design. The V5 series consists of many different slim budget systems featuring varying display sizes (11.6-, 14.0-, and 15.6-inch) and different hardware configurations. 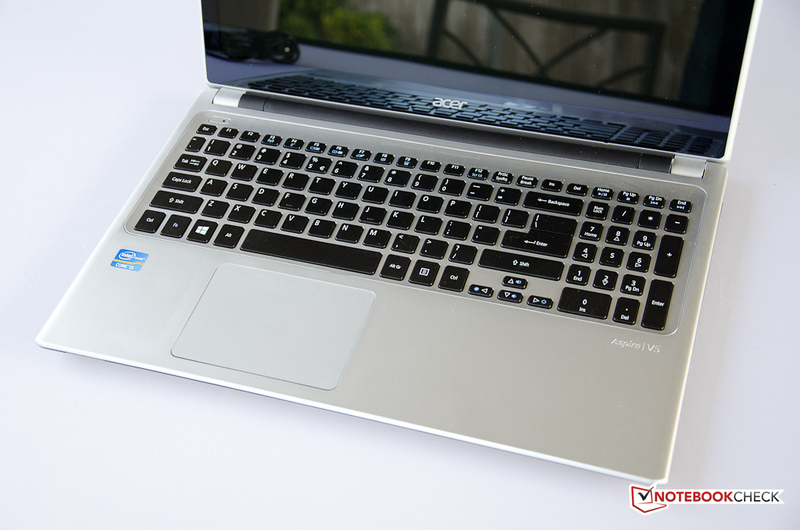 We've already reviewed the Acer Aspire V5-571G - a at least from the design perspective nearly identical notebook - which features the same Intel Core i5-3317U dual-core ULV processor, but includes a dedicated Nvidia GeForce GT 620M graphics card to please the budget-oriented gaming crowd. 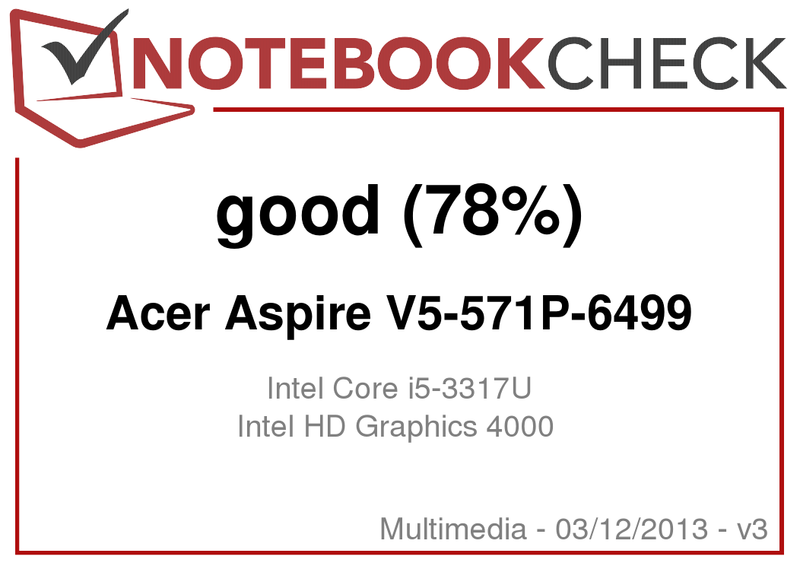 Our review model Aspire V5-571P-6499 includes the aforementioned processor Intel Core i5-3317U, a 500 GB conventional hard drive, 4 GB of RAM, and a touchscreen - all for a little over $700. Touchscreen notebooks with large displays are still a pretty rare breed: Sony recently announced the Vaio T15 touchscreen Ultrabook - and earlier this month we took a look at the HP Spectre XT TouchSmart 15-4000eg Ultrabook. Even though our Aspire V5-571P features the same processor as the Spectre XT TouchSmart, it's clearly not in the same league, as the Spectre costs nearly twice as much. Where appropriate, we'll compare our review candidate with the - admittedly smaller - 14-inch Asus VivoBook S400CA-CA006H and 13-inch Sony Vaio SV-T1312V1E instead. Despite the pleasingly slim design and the ULV processor, the V5-571P-6499 does not quite meet Intel's Ultrabook thickness-standard, which dictates a maximum of 0.83 inches for systems with 14-inch and larger displays. The V5-571P-6499 measures 15 x 10 x 1 inches and weighs in at a reasonable 5.3 pounds (6.0 pounds including the power adapter). While the silver-colored chassis may evoke the look of brushed aluminum at first, there is no mistaking the fact that it's made entirely from plastic - but that's not really surprising given the low price point. The bottom of the base unit as well as the (removable) battery are black plastic. We do appreciate the fact that Acer managed to integrate an optical drive (8X DVD±RW DL) into the quite modern looking and slim design. 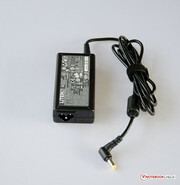 The battery - a skinny 4 cell model - is not integrated permanently, but snaps in and can be easily replaced by the user. The build quality is pretty typical for a budget system: while the slim chassis is actually reasonably stiff, it does protest with the occasional creaking sound when twisted. The lid is torsionally not very rigid and susceptible to flexing when pressure is applied. The panel of our review unit seemed a bit warped as well, as the corners of the display didn't lay complete flat against the base unit. The keyboard tray exhibits a pretty noticeable amount of flex all around, especially in the area above the optical drive. The gaps of our review model are generally very even, though. The hinges are quite stiff and hold the display lid fairly secure in any position. We didn't notice excessive bouncing, either - important for a touchscreen device. The display opens up to a maximum angle of 170 degrees, which should suffice for most users, but the touchscreen might be more useful if the display could be tilted back all the way and rest on the surface the laptop is sitting on. The build quality, feel, and fit and finish are certainly acceptable given the price of the notebook. The port selection is also standard fare: the Aspire V5 offers two USB 2.0 ports and one port supporting the faster USB 3.0 standard. 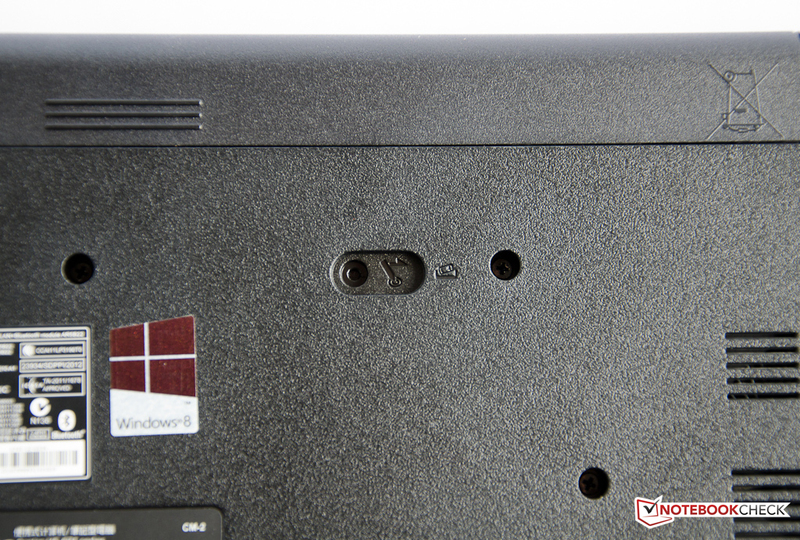 We do have a real issue with the placement: all three ports are located next to each other on the left side and pushed towards the very front of the notebook. To make matters worse, the HDMI port and the proprietary port for the Ethernet/VGA dongle are also housed on the left side in the front half of the notebook. Especially lefthanders are going to have issues with cables and devices crowding the workspace. 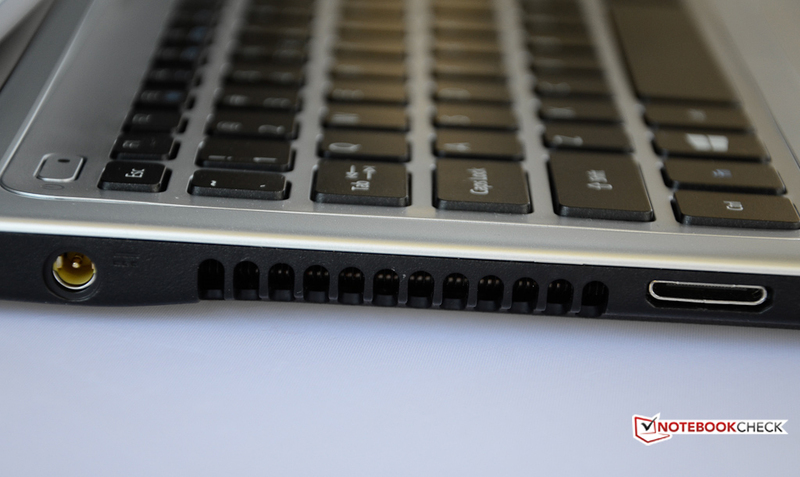 The USB ports are also extremely close together, so larger thumb drives and other devices might not fit. While a DisplayPort would have been a nice addition, we didn't really expected to find one on this rather inexpensive notebook. The Aspire V5-571P-6499 incorporates a Qualcomm Atheros Wireless Network Adapter (model AR5BWB222), which supports standards 802.11b/g/n and allows for a theoretical throughput of up to 600 Mbit/s. Our tests of the reception quality revealed no issues. 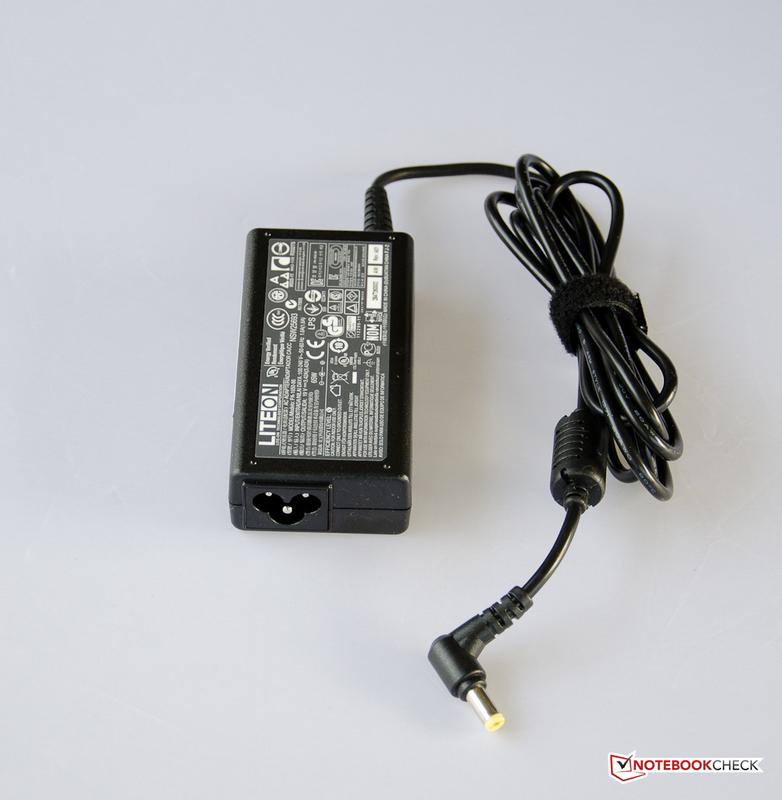 For cable-based connections, Acer includes a Gigabit Ethernet module from Realtek - although the network cable needs to be connected to the proprietary Ethernet/VGA dongle (included). Aside from the notebook, the smallish 37 Wh battery, a 65 watt power adapter, and the Ethernet/VGA dongle adapter, Acer includes a few brochures and a warranty pamphlet. Recovery media is not included - a pretty common practice. The user is urged to create their own set of recovery discs. Although Acer offers an additional battery for a reasonable $39 in their Acer Store online, batteries with larger capacity are unfortunately not offered. Acer pre-installs several software titles. We like the Acer Recovery Management, which can be used to restore the factory settings, setup a customized restore, or reinstall drivers and applications. Acer clear.fi Media and clear.fi Photo allow the user to share and playback media over multiple compatible devices. A trial versions of Office 2010 is also included. 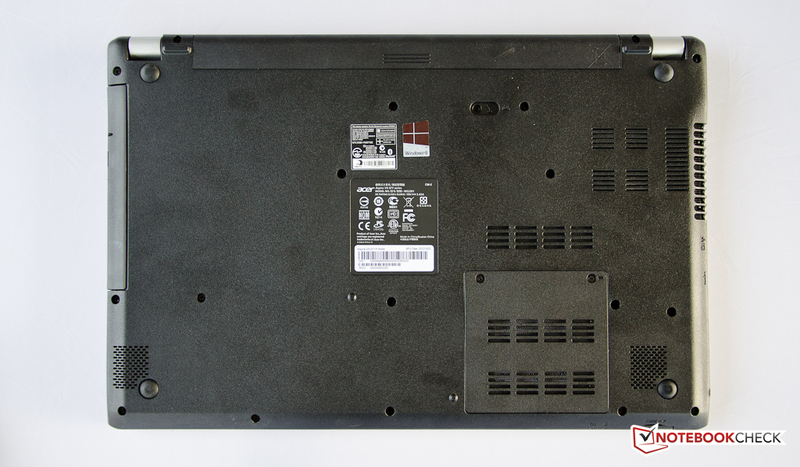 The underside of the notebook is home to a small cover (secured with two screws) which allows access to some of the internal components. Unfortunately, only the two memory slots (one free) are accessible - to clean the fan or replace the hard drive, further disassembly of the notebook is required. In the US, Acer offers a standard 12 month warranty against manufacturer's defects. 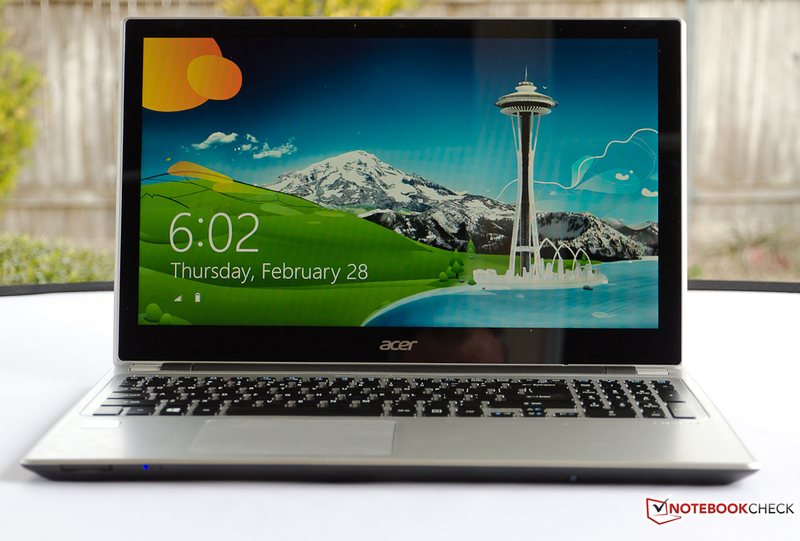 Online retailers and Acer themselves sell additional warranty packs called "Acer Advantage". The chiclet-style keyboard takes up the entire width of the notebook and features a separate numberpad with slightly narrower keys. The main keys measure 0.59 x 0.59 inches, are completely flat, made from a satiny-looking black plastic, and have ample space between them. While the layout of the keyboard is very functional, key travel is short and the tactile feedback a bit limited partly due to the spongy nature of the keys themselves, but also because of the noticeable flex of the keyboard tray during spirited typing sessions. 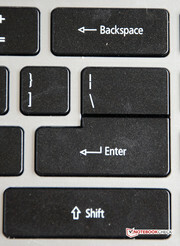 The Enter and Shift keys are large; the arrow keys - which are separated from the main area - are only about one third of the size of the main keys. We do appreciate the backlight (on/off only) - most lower-priced notebooks do not offer one. Overall, the keyboard is pretty comfortable to type on and also very quiet. We would prefer keys with a slight indentation to allow the fingers to find the center more easily and thus improve the typing experience. While the previously reviewed Aspire V5-571G featured a Synaptics touchpad, Acer uses an Elan SmartPad for the 571P. The touchpad is quite large at 4.13 x 3.03 inches and features a matte surface which allows the fingers to glide very easily. 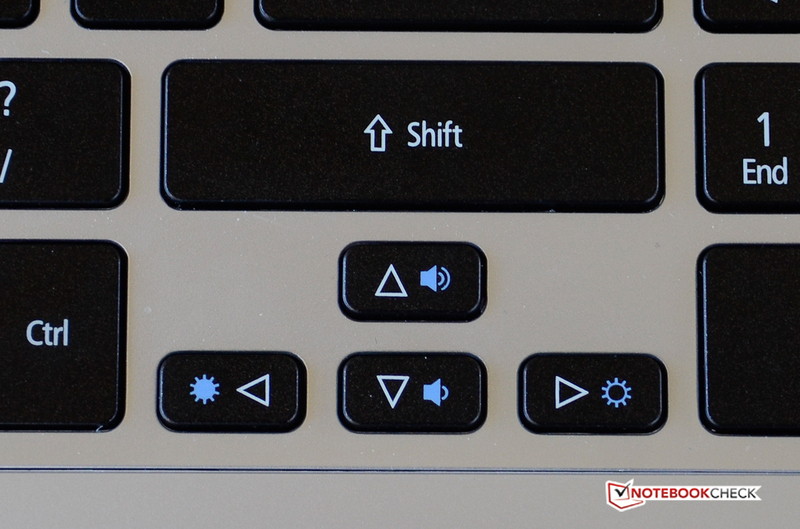 The pad doesn't features separate mouse buttons - rather, the entire surface is clickable. Like most modern touchpads, multi-touch gestures (like pinch-to-zoom or two-finger scrolling) are supported and generally work well, although we had an issue with gestures not being recognized once or twice. 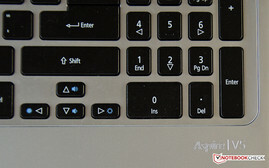 The touchpad is located left of the center because of the full numeric keypad, but is lined up evenly with the G and H keys. 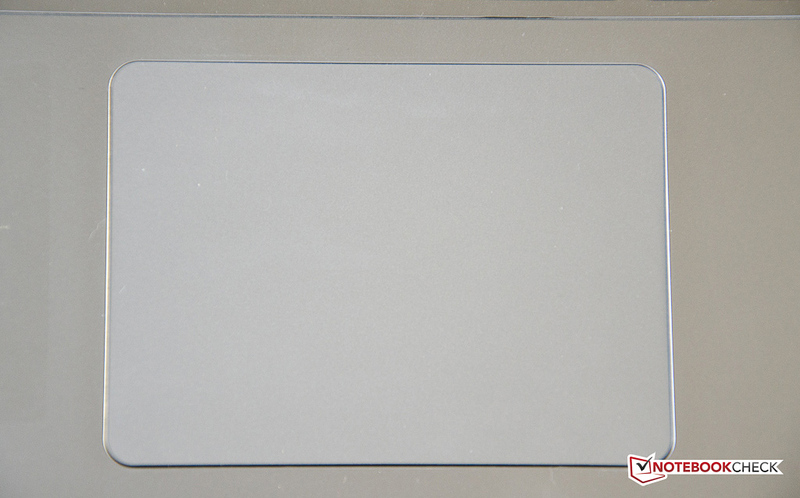 In addition to the touchpad, the user can also operate the V5-571P using the 10-point, 15.6-inch touchscreen. We were pleasantly surprised with the general operation and the sensitivity: finger input is accepted quickly and accurately - the screen was always responsive when we tried the typical gestures like swiping, zooming, or rotating. The jury is still out as far as usefulness of a touchscreen on a regular notebook is concerned: while we got tired of trying to hold up our arm to operate the screen rather quickly, other users might really appreciate this additional method of operating their notebook. One of the main attractions of the Aspire V5-571P-6499 is of course the 15.6-inch LED-backlit touchscreen from AUO (model B156XTN03). 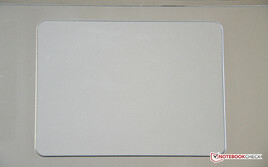 The edge-to-edge glass display features a resolution of 1366 x 768 pixels (WGXA) - certainly adequate for the touchscreen control, but very low for a panel this size and more at home on smaller budget systems - in fact, both 13-inch Sony T13 SVT1312V1ES and the 14-inch Asus VivoBook S400CA offer the same resolution. 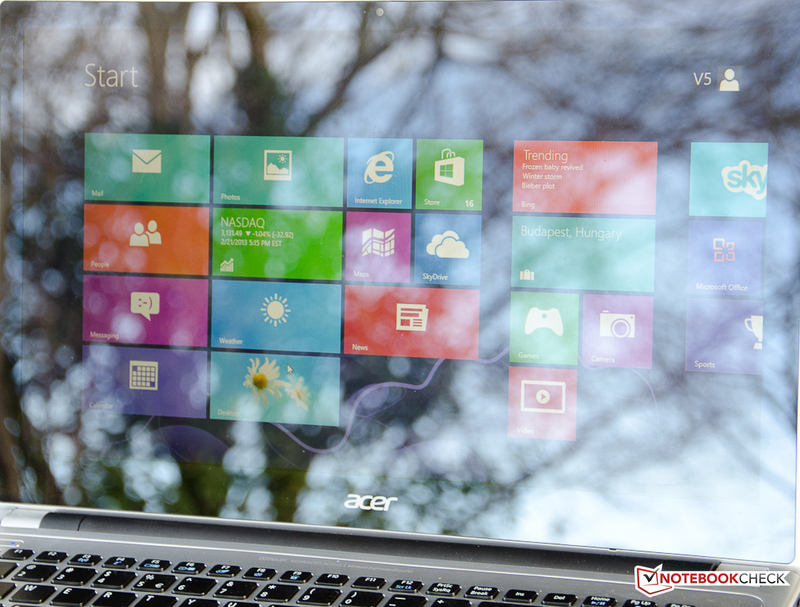 Acer doesn't offer higher-resolution displays for this particular notebook or the non-touchscreen versions of the V5 series. Since this is a very slim system and not a bulky desktop replacement, we would expect users to venture outside with their notebook at least occasionally. 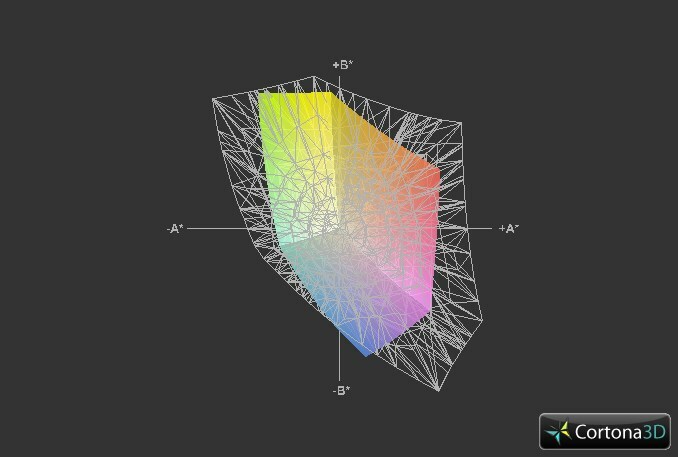 When we checked the average brightness using the Gossen Mavo-Monitor, we measured a very low 172 cd/m². The competition doesn't do it much better though: the Sony T13 actually posted an average brightness of only 155 cd/m², the Asus VivoBook a comparable 175 cd/m². 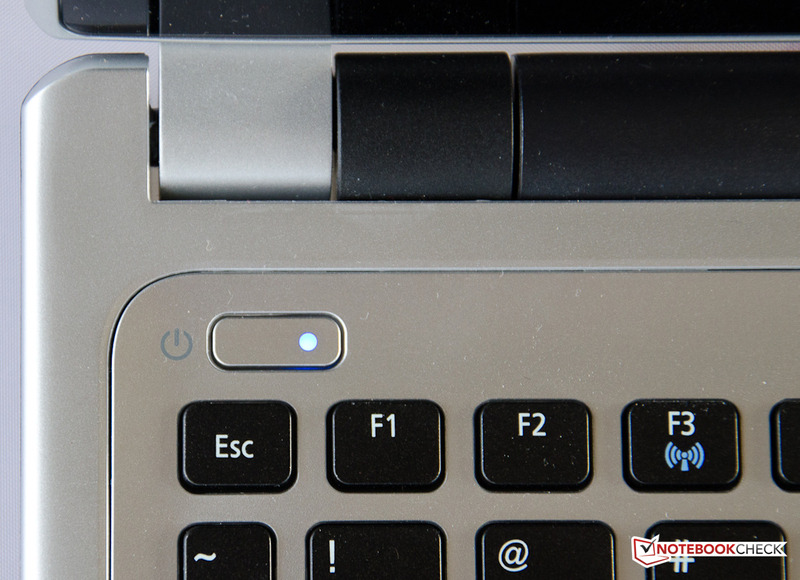 While the notebook is running on battery, the maximum brightness drops to 159 cd/m². 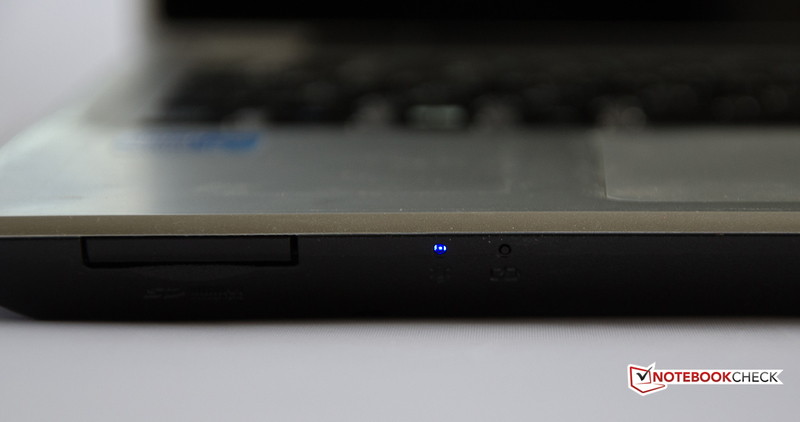 The black value of 0.28 cd/m² and the contrast ratio of 664:1 are also very good (Sony T13 254:1, Asus VivoBook 487:1). One advantage of the glare-type screen: subjectively, colors actually look pretty good and sufficiently vivid. The TN display is able to reproduce about 61 percent of the total sRGB spectrum - in line with other budget panels. 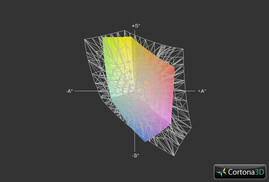 Those interested in photo editing should probably look elsewhere - but for daily use, the color accuracy is sufficient. Combined with the glare-type screen, outdoor use on all but the cloudiest days is next to impossible. Even in the shade or indoors, the very noticeable reflections become tiresome quickly. 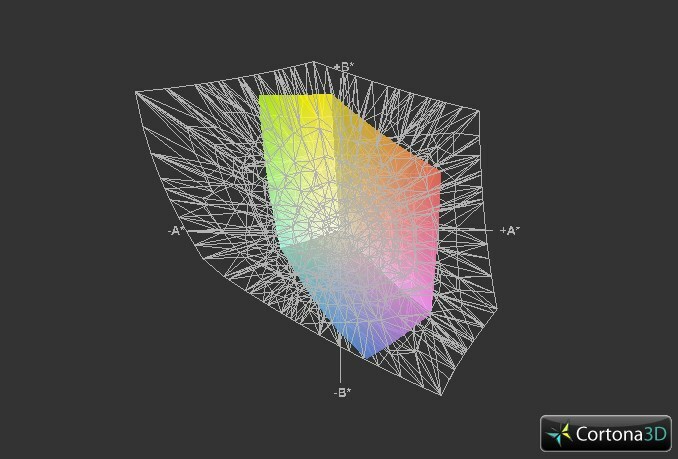 The viewing angle stability is also typical for the class: deviations from the center line to the side result in fairly minimal changes, but color shifting and inversions are immediately evident if the display is viewed from the top or the bottom. Users needing much better viewing angles can expect to pay a lot more: the Asus Zenbook Prime UX31A Touch-Ultrabook is equipped with a display based on IPS technology and features superb viewing angle stability (along with high brightness and good contrast). The touchscreen Aspire V5-571P is offered in several different configurations. In order to keep both power consumption and heat emission in check, Acer chose to incorporate ULV processors with a TDP (thermal design power) of 17 watts. 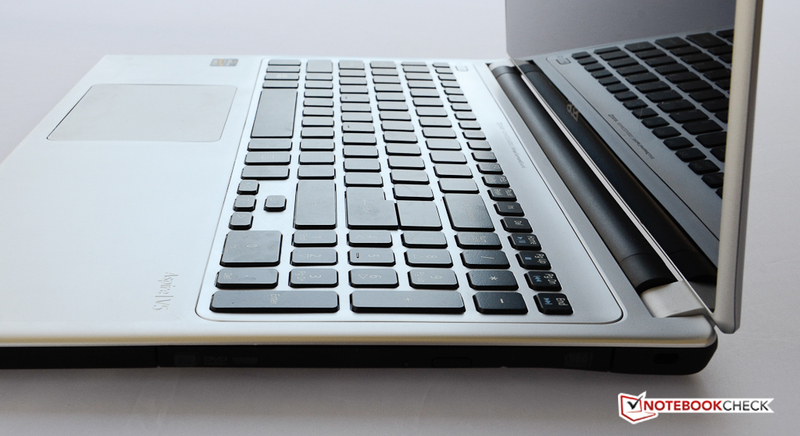 Our review model features the dual-core 1.7 GHz Core i5-3317U and retails for $729. 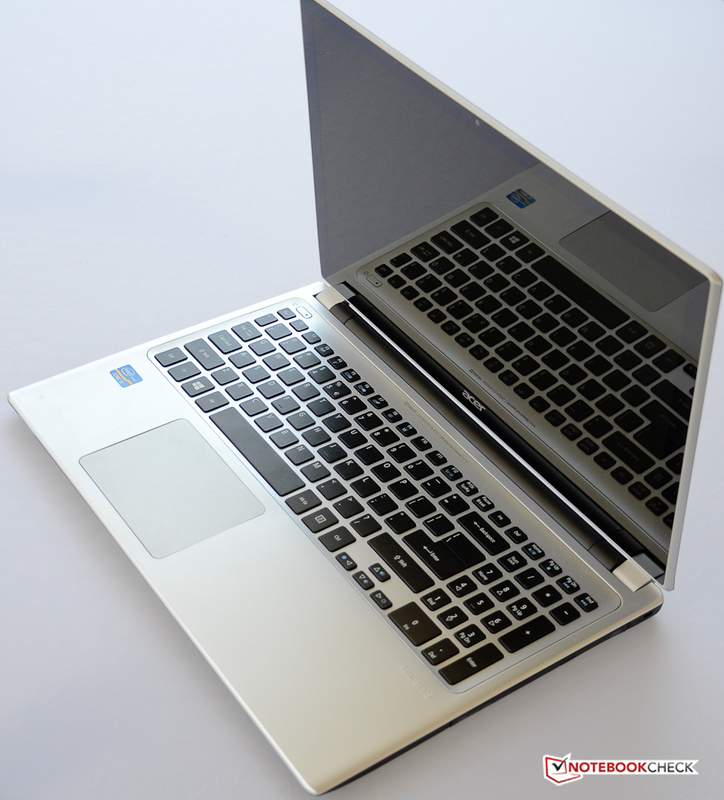 Other versions come with the lower-end Core i3-3217U or the higher-end Core i7-3537U. Prices range from ~$700 to ~$1000 (the most expensive model not only includes 8GB of RAM and a 1 TB hard drive, but also a dedicated GeForce GT 710M). The V5-571P-6499 ships with 4GB of RAM. In many instances, this should be sufficient for normal office or productivity use. 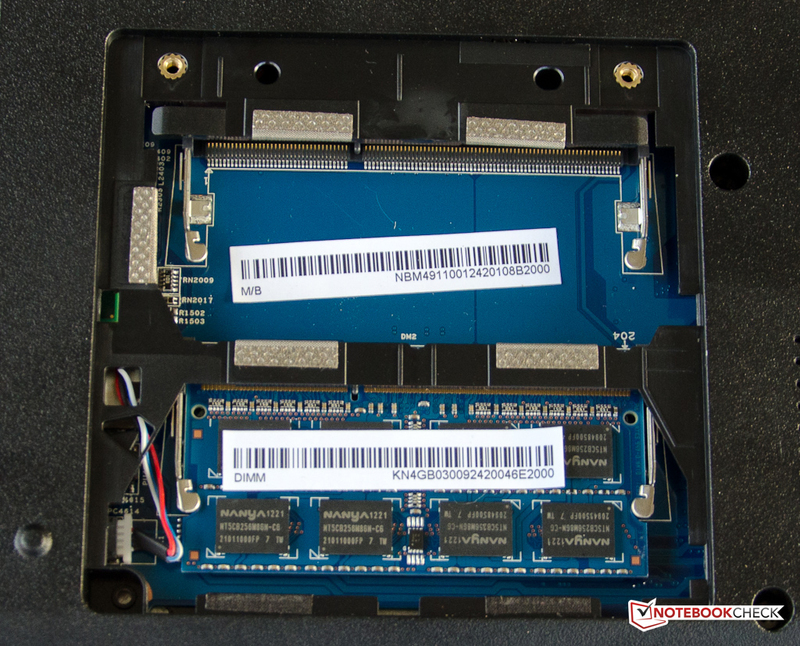 Since Acer uses a single PC3-10600 (1333 MHz) DDR module, the memory operates in single-channel mode, so a reduction in memory bandwidth and subsequent performance loss can be expected. Even though Windows 8 is more memory-efficient than previous OS versions, it might be benefitial to add a second module (one slot is open) to have the RAM operate in dual-channel mode. The Core i5-3317U is a member of Intel's Ivy League series and a third-generation Core iX processor. This ULV CPU, which is manufactured using the 22nm process, has a nominal frequency of 1.7 GHz but supports Turbo Boost up to 2.4 GHz for both cores or 2.6 GHz for a single core. For detailed information and a comparison to other mobile processors, please take a look at our page here. The notebook managed a score of 2.37 points running Cinebench R11.5 Multi - identical or within a few percentage points of the other touchscreen systems mentioned in this review: the Sony T13 SVT1312V1ES also scored 2.37 points, the Asus VivoBook S400CA was a bit faster and ended up with 2.41 points. Generally, the CPU maintains its Turbo Boost speed of 2.4 GHz during the CPU tests - only when the GPU is under heavy load also, performance drops - although throttling never occurs (see the section entitled "Temperature" later in this review). The Core i5-3317U is certainly no powerhouse - but nonetheless very capable of handling everyday computing tasks. The processor executes both the single- and the multi-core Cinebench benchmark tests at the maximum nominal Turbo Boost frequency of 2.4 GHz for both cores; during the single core test, we saw only very infrequent jumps to the single-core maximum of 2.6 GHz. The results of the CPU and the GL Benchmarks are very comparable to the other contestants - not surprising, since both Ultrabooks use the same CPU/GPU combination. Even the much more expensive HP Spectre XT doesn't offer any performance advantages in this area. The overall system performance is a result of how the individual hardware components (CPU, graphics card, RAM, and hard drive) interact with each other. The hard drive is clearly the main bottleneck here, as the Acer Aspire V5-571P finished the PCMark 7 benchmark test with 2319 points - not a great result when compared to the SSD-equipped Sony Vaio SV-T1312V1E, which scored 4441 points (+ 91 percent). 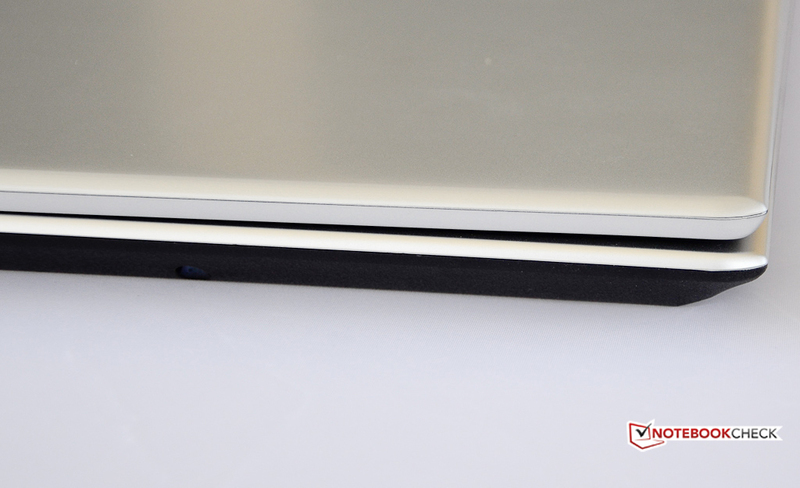 Even the Asus VivoBook S400CA, which features a conventional platter-based hard drive but also a cache SSD, outscored our review system with 2823 points (+ 22 percent). Another potential bottleneck is the RAM configuration: since there is only one module installed - a common practice on lower-end and even some high-end systems - the RAM operates in single channel mode. This easily and comparatively cheaply remedied: we recommend installing a second 4 GB module to make the RAM operate in dual channel mode. Subjectively, performance is more than adequate for office-type tasks, movies, and web browsing: boot up and shut down happen quickly (20 and 15 seconds, respectively), and application performance is also snappy enough. Acer uses a conventional platter-based hard drive from Hitachi. The 500 GB Travelstar Z5K500 (HTS545050A7E380) features a rotational speed of 5400 RPM and 8MB cache. Because of its single platter construction, the 7 millimeter drive features relatively high data density and thus still acceptable transfer rates despite the low rotational speed - although it's certainly no speed demon by any means. According to HD Tune, the drive is capable of an average transfer rate of 92.1 MB/s and a maximum transfer rate of 115.1 MB/s. Hybrid hard drives with their SSD cache tend to have comparable average speeds but much higher maximum transfer rates: the Seagate Momentus Thin ST500LT012 in the Asus VivoBook is capable of 189 MB/s, for example. Pure SSD drives are of course are much faster still. The average access time of the Travelstar Z5K500 is its Achilles heel: we measured a very slow 20.4 ms. 7200 RPM drives definitely have an advantage in this regard. Even considering the low price point, we would have liked it had Acer at least included a SSD cache drive to speed up the frequently used applications and programs. For a detailed insight into the performance of various hard drives and SSDs, please refer to our HDD/SSD comparison table. 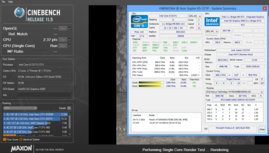 The Intel HD 4000 integrated into the i5-3210M idles at 350 MHz but can overclock to 1050 MHz via Turbo Boost. During the Cinebench R11.5 GL benchmark, the GPU achieved frequencies between 950 MHz and 1050 MHz; on battery power, we saw more frequent dips down to 850 MHz. 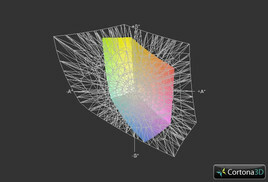 The scores are almost identical regardless of the power source, however (11.76 fps and 11.69 fps, respectively). The integrated graphics card is just good enough for the occasional game - although reduced resolution and low details (deactivated anti-aliasing) are more or less a requirement. The performance of the Intel HD 4000 underlines its status as a GPU for productivity and not gaming machines. As such, games like Fifa 13 work reasonable well, but many modern and more demanding titles are more or less unplayable at higher resolutions. 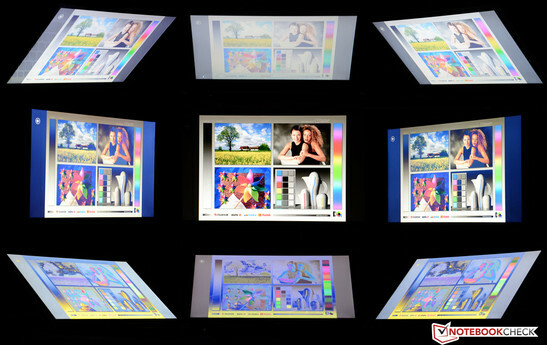 Notebooks with ULV processors have a major advantage since their hardware generates less heat. During idle, the fan is off and the system is barely audible under typical work conditions - we measured an average of 30.6 dB. Under load, the noise level increased to 36.9 dB. While this is still acceptable, the somewhat high-pitched sound of the fan can get annoying during prolonged sessions. During the stress test (Furmark and Prime95 running at the same time), we saw up to 42.2 dB - still in line with many other notebooks and Ultrabooks. The HP Spectre, for example, topped out at a fairly high 44.2 dB. This worst-case scenario is rather unlikely during normal use. The optical drive can get fairly noisy, too - we measured 36.2 dB during DVD playback, which is definitely audible during quiet passages when watching movies. 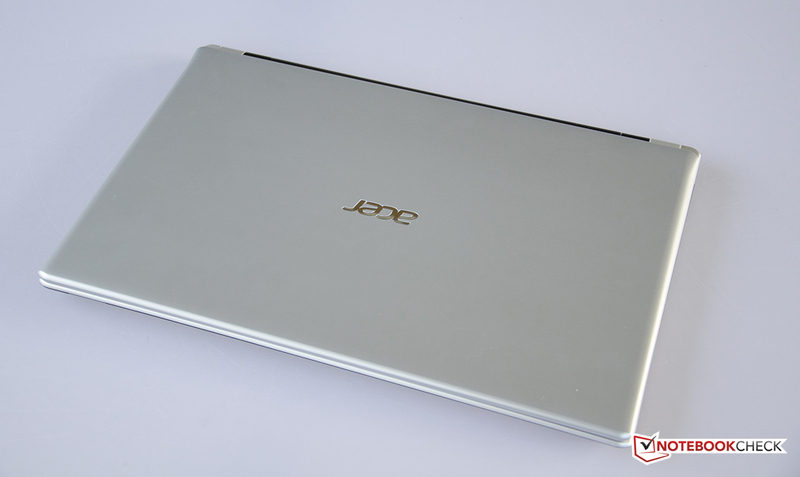 Despite the rather slim chassis, the Aspire V5-571P remained admirably cool. During idle, we measured temperatures from 22.4 to 32.2 degrees Celsius ( 72.32 to 89.96 degrees Fahrenheit). During the stress test, the system reached temperatures of up to 38 degrees Celsius (100.4 degrees Fahrenheit). The hot spot is in this case the bottom front left corner. The temperature of the palm rest is still very well controlled even during maximum performance - we measured 29.4 degrees Celsius (84.92 degrees Fahrenheit) to the left and right of the touchpad. Of course, the utilization levels achieved during the stress test scenario are not likely to occur during daily use. Even after running the notebook under full load for an extensive period of time, we had no issues when we started working with the system on our lap. We use Prime95 and FurMark together for at least one hour to check for throttling. While we saw speeds of 2.4 GHz (both cores in use) during CPU-specific tasks (Prime95 only), the inclusion of the GPU caused the processor to drop to its nominal frequency of 1.7 GHz, while the GPU maintained between 800 and 850 MHz. The temperature of the CPU/GPU never topped 69 degrees Celsius (156.2 degrees Fahrenheit) during our test. During all of our tests, throttling was never an issue. When we ran the laptop on battery during the stress test, we saw a slight drop of the GPU frequency to 750 - 800 MHz; the CPU speed remained stable at 1.7 GHz. A subsequent test with 3DMark 06 revealed no performance loss compared to the test run after a cold start. Overall, Acer did a very good job of controlling both the internal and external temperatures. 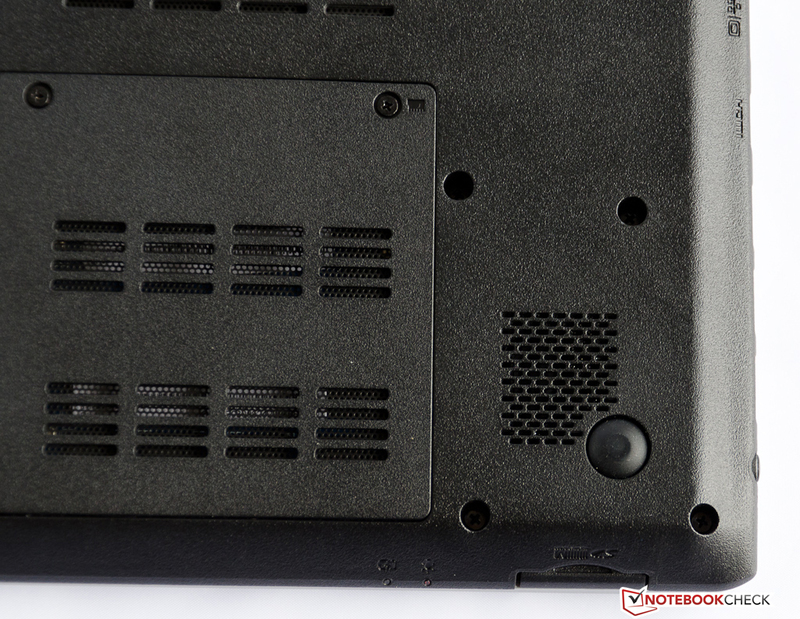 The two stereo speakers are located on the underside of the notebook towards the front edge. Although a logo above the keyboard touts "Dolby Advanced Audio | Virtual Surround Sound", we were less than impressed with overall sound quality. The highs are overly present, while base and mids are lacking. The sound is certainly good enough to watch a movie; for music we would definitely recommend external solutions using the 3.5 millimeter combination jack or the HDMI port. Since the speakers are on the bottom, the sound also changes depending on what kind of surface the notebook is sitting on. The maximum volume, on the other hand, is sufficiently loud even for larger rooms. Acer advertises the V5-571P to have a "5-hour battery". To determine the maximium battery life, we ran the BatteryEater Reader’s Test. For this test, the display brightness is turned down all the way, WiFi is disabled, and the Power Saver Profile is in use. Using the these settings, the system shut down after 4 hours and 48 minutes - short of the promised 5 hours. To establish the minimum battery life, we used the BatteryEater Classic Test at the maximum brightness, with WiFi turned on and the Performance Profile enabled. The notebook turned itself off after only 1 hour and 14 minutes. To simulate a more likely usage scenario, we use the WLAN test. During this test, a script simulates typical web surfing conditions and visits a new page every 40 seconds until the battery runs out. We normally use the Balanced Profile and turn the screen brightness to about 150 cd/m² - but in the case of this notebook, it required the screen brightness to be set to maximum. The V5 was able to last 2 hours 59 minutes before we had to plug it in again. Since this notebook features an integrated optical drive, we also tested the runtime while watching a movie: 2 hours 27 minutes should be enough for any normal feature-length film. There is no question that the Acer Aspire V5-571P could benefit from a larger battery: 37 Wh is woefully inadequate for a notebook this size. Let's compare: the Sony Vaio SV-T1312V1E comes with a 45 Wh battery and lasts 5 hours and 50 minutes during the WLAN test. The 14-inch Asus VivoBook S400CA-CA006H has a 44 Wh battery and lasts for 3 hours and 24 minutes. At least the battery is replaceable and fairly cheap ($39 according to Acer's website). Of course, most users would prefer to not have to worry about charging an additional battery - especially since it takes about 3 hours for a full charge. 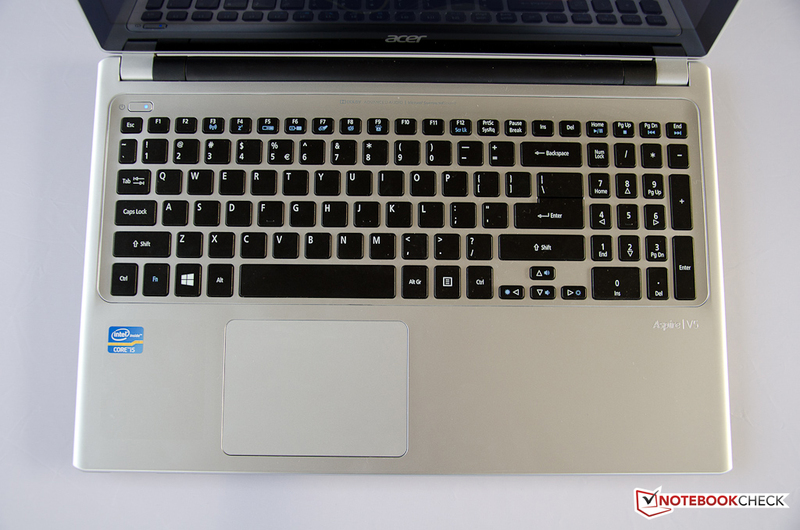 The Acer Aspire V5-571P-6499 is a stylish and slim, yet inexpensive (street price under $700) 15.6-inch touchscreen system which takes full advantage of the Windows 8 touch-optimized interface. The build quality as well as the ergonomics are acceptable for a budget system. We appreciate the fact that Acer manged to squeeze an optical drive into the chassis and have no gripes with the overall performance: the system is powerful enough to handle the daily workload and stays cool doing so. We do have issues with the rather anemic battery life of 3 hours and the very low brightness of the display, which makes working outdoors very hard indeed. If a touchscreen is a necessity, both the 14-inch Asus VivoBook S400CA-CA006H and the 13-inch Sony Vaio SV-T1312V1E are viable alternatives. 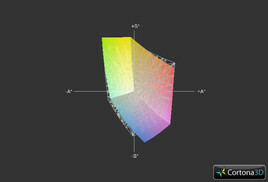 Sony now also offers 14- and 15-inch (1920 x 1080 pixels) models in the T-Series. Various versions of the 15.6-inch HP Spectre XT TouchSmart (now with 1.9GHz Intel Core i7-3517U; 1920 x 1080 pixels) start at around $1250. 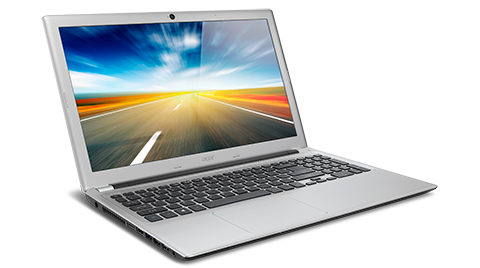 If it doesn't have to be a touchscreen, Acer's own V5-571-6892 offers a 1.8 GHz i5-3337U processor, a 500 GB hard drive, and 6 GB of RAM - all for about $70 less (street price ~$630). Our review example features a slightly warped display lid. 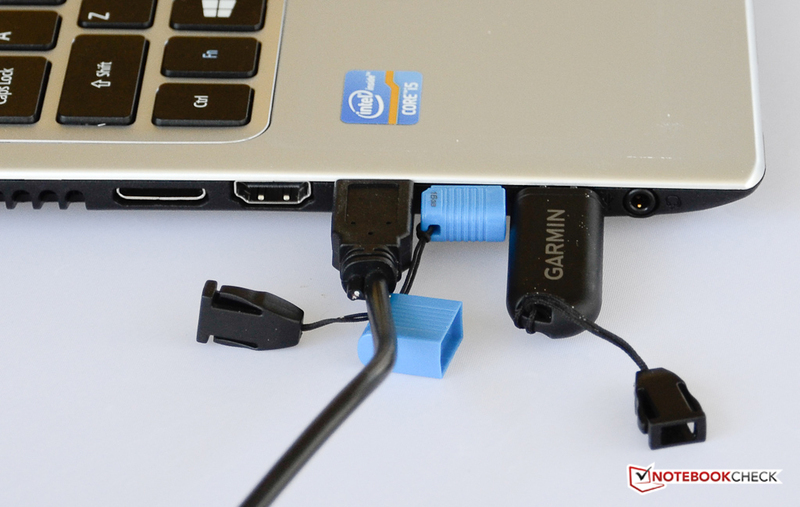 Crowded USB ports - even with slim drives and cables. 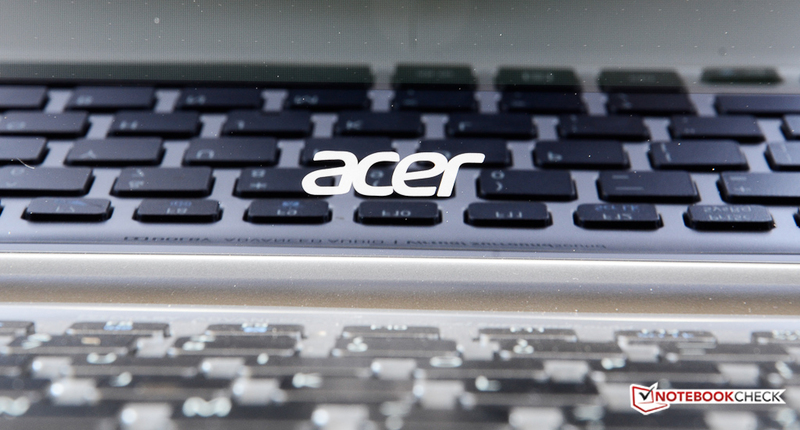 The Acer logo on the the display. The edge-to-edge display is highly reflective. The keyboard looks nice but flexes too much. Hard to see: the status LEDs. One of the speakers grills. Acer includes an optical drive. 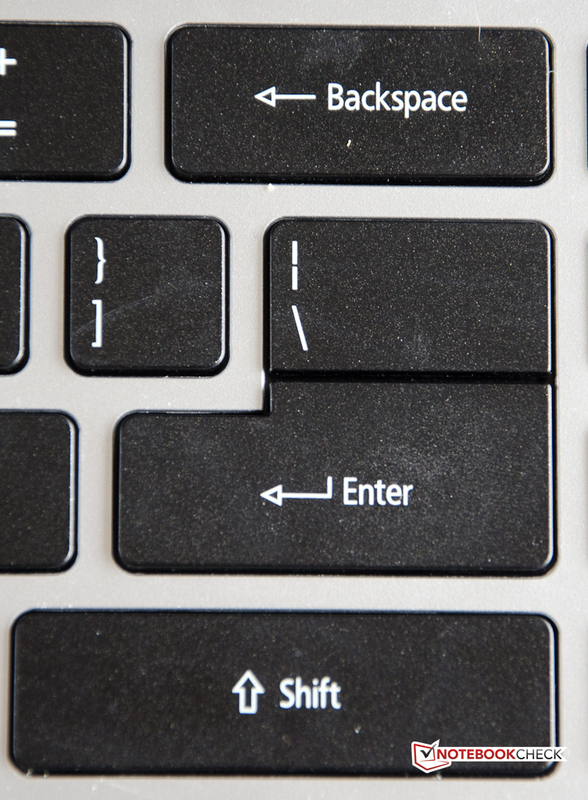 The large Backspace, Enter, and Shift keys. Very small arrow keys - about 1/3 of the size of the regular keys. ...and a full-sized keyboard with numberpad. The keyboard is backlit - a rarity in this price range. The keyboard backlight in action. 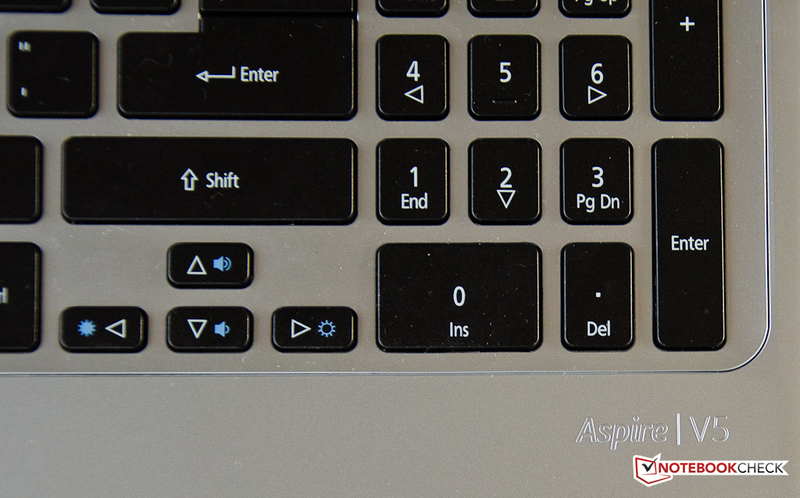 The power button is precariously close to the Esc key. The Dolby-logo promises great sound quality but fails to deliver. The touchpad is not in the center of the palm rest. Black plastic on the bottom. Only the RAM slots are accessible. The display doesn't tilt back all the way. The slim and stylish design and the affordable price. The overall performance and the effective cooling system. Much better battery life and a brighter screen. Acer's decision to outfit this notebook with a tiny 37 Wh battery. The 14-inch Asus VivoBook S400CA-CA006H (S400CA-DH51T in the US - street price ~$700), the 13-inch Sony Vaio SV-T1312V1E (US model equivalent SVT131390X with a 256GB SSD and 1.8 GHz i5-3337U: price ~$1070 directly from Sony). HP's 15.6-inch Spectre XT TouchSmart (now with 1.9GHz Intel Core i7-3517U; touchscreen with 1920 x 1080 pixels) for about $1250. If a touchscreen is not absolutely necessary, Acer's own V5-571-6892 with a 1.8 GHz i5-3337U, a 500 GB hard drive, and 6 GB of RAM for about ~$630.